1. Avoid background checks that use only national databases. Using standard national databases to yield quick (usually online) background “checks” at a very low price is the most common error of this type. With a national criminal database check you can cover a large swath of the more than 3,000 U.S. jurisdictions with a single search so it’s tempting to search such a database and call it good. But be warned that a national database search should never be your one and only source of criminal records research. While a national database search can provide useful “pointers” to guide specific local criminal searches, it is not a replacement for a local-level search. Why? Not all jurisdictions grant access to their data and not every database is well managed to ensure accuracy, completeness, and timeliness. 2. Screen contingent employees to the same level as your standard employees in the same role. Just because you employ someone on a contingent basis (as a contractor, or as part of the “gig” economy), doesn’t mean you are freed of responsibility for their behavior. Some employers seem to think that not having to pay employment tax or health insurance premiums for someone means they are immune to liability when failures occur. Remember: every contingent employee represents your business, your brand, and your integrity. And legally, if a contingent employee causes a problem that might be considered negligence when working on products or services for you, you will likely find yourself in the crosshairs. 3. Private identity information matters, so be careful in hiring offshore background screening providers. Sending personally identifiable information offshore for processing or hiring a “background check” provider that operates offshore, can set you up for problems. When the personal information of your applicants or employees goes offshore, the protection of U.S. laws is lost, but your responsibility and liability for the information is unchanged. It’s important to note that U.S. laws like SB-909 in California and federal laws including Gramm-Leach-Bliley and HIPAA set standards for personal data protection. These laws include enforcement and penalty rules that could be very damaging to an employer. 4. Maintain a program of continuously screening employees. Times change, organizations change, roles and responsibilities change, employees change. That previous background check may no longer be applicable. It may be more obvious that a new background check is needed when an employee makes a significant job role change, but it is equally important to screen existing employees regularly on a basis determined by the risks they might pose. The general point is that the “fit” between an employee, a job, and an organization can change over time so that you no longer have objective information about whether you are mitigating the risks that person poses in that job. A program of regular re-screening can take care of the problem. 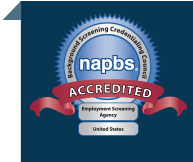 Learn more about background screening and best practices in our latest guide, The Essential Screening Guide for Employers.